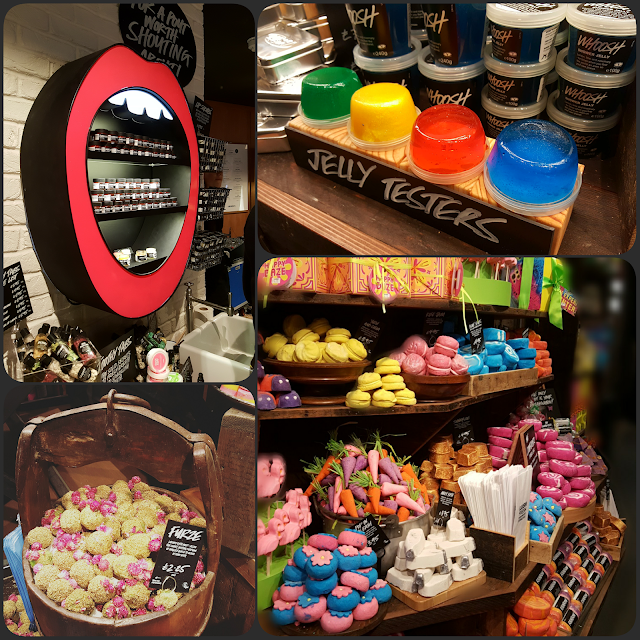 Last week marked the long awaited official opening of the Lush Spa Cardiff and oh what an opening it was! As a massive Lushie since the late 90's, saying I was excited would be a huge understatement. If exclusive products and unique spa experiences are your thing then keep reading as I have some treats for you. The moment you step in you are surrounded by bright, colourful and aromatic things before being promptly presented with a cloud cocktail demonstration. A cocktail clients are given before certain treatments. I won't go into too much detail as you need to experience this for yourself and I don't want to give away too many spoilers. 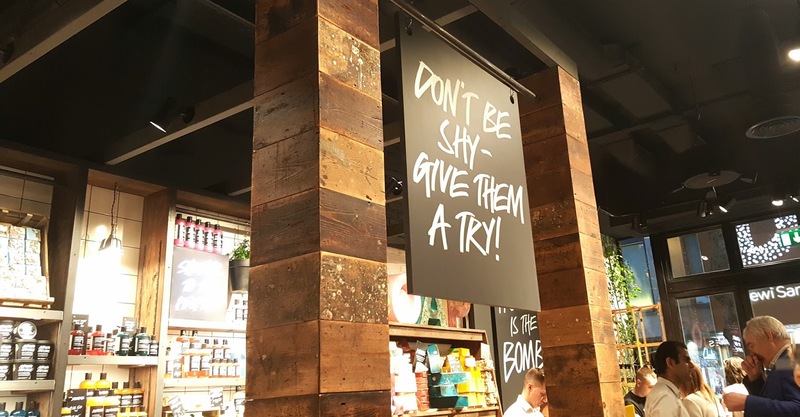 Lush Cardiff is the first Lush Spa in Wales and the 5th in the world (bare in mind there are 932 Lush stores) to have the full range of Emotional Brilliance. I am quite new to this range but saw several demonstrations and am truly impressed. 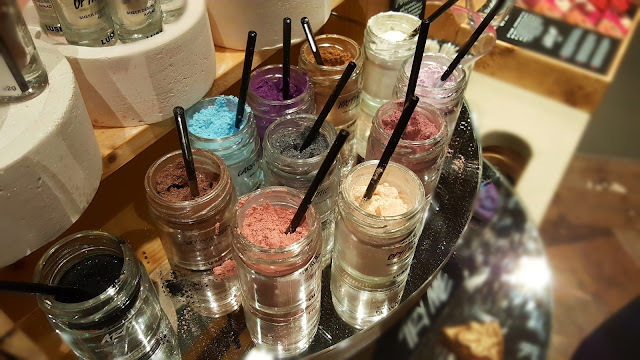 In true Willy Wonka style, some products even change colour when mixed with moisturiser. SOLD! The shop itself is huge and it makes me so happy that it is made mostly of upcycled, animal and eco friendly materials. (They've truly put the Lush spirit into every aspect of this store). There are several sinks dotted around, perfect for product demonstrations and attempting/failing to wash the glitter off your hands which I guarantee you will acquire. One of my favourite things are the plants all over the place. Lush Cardiff has all the bath melts available at Oxford Street and they look and smell amazing. 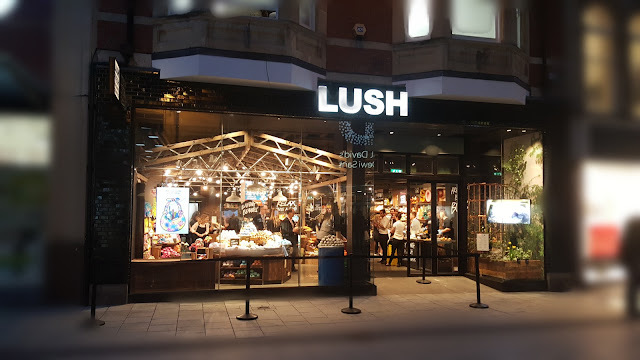 There were several exclusive limited edition products available including a Snow Fairy perfume, Twilight body spray, Yellow Submarine and Metamorphosis bath bombs to name but a few. I wish I had spent more time in their new skincare area. Here customers can get skin care consultations if you are feeling a bit overwhelmed with choice. 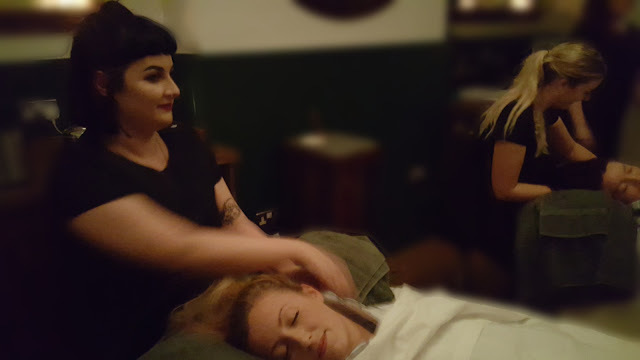 You can also have a little pick-me-up hand or arm massage here too. I will definitely be heading back soon for a chat with one of the many very professional and super friendly staff members. As a holistic therapist in training, I was most excited about the spa. Heading to the back of the store, I boarded a glass elevator filled with bird song making my way up to an old English country house. Huh? Yep, the spa is themed like a cute quaint house. To think not moment before I was in the busy Welsh capital and now I'm in the tranquil countryside. Magic. Your consultation starts in the 'kitchen' before moving to the 'living room'. There are fully equipped bathrooms to use before and after your treatment if you desire. By fully equipped I mean a state of the art shower, a fan-less Dyson hairdryer and Lush products galore for you to use. Bliss! When can I move in please? 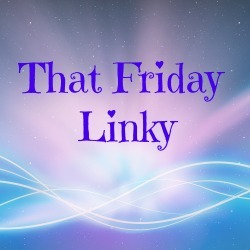 I had a sneak peak at a few of the spa treatments, each totally unique and completely multi-sensory. A Beatles themed, Hard Days Night Treatment which is a relaxing, passive stretching massage. Perfect for those who aren't too keen on getting their kit off as you get to wear a pair of comfy pyjamas during your treatment! The one I was most excited about was The Comforter. A chocolate body scrub followed by a rose oil massage. Who doesn't want to smell like a Turkish delight? I also eyed up an intriguing bubble blower in the corner. It was great getting to watch the treatments in progress and I wish I could have watched a whole treatment from start to end. To add to my excitement, at the end of each treatment you get made a tea catered to how you want to feel. TEA! My two passions combined. Massage and tea! Dreams can come true. I think this is an amazing combination and I am happy to see this marriage come together in my favourite store. Treatments start at £50. I am already planning on booking myself in post-exams. As a holistic masseuse I cannot stress enough how beneficial massage can be. You can view the Lush spa treatments here. Why yes, that is the Lush co-founder Mark Constantine in the corner. Pictures simply don't do justice. 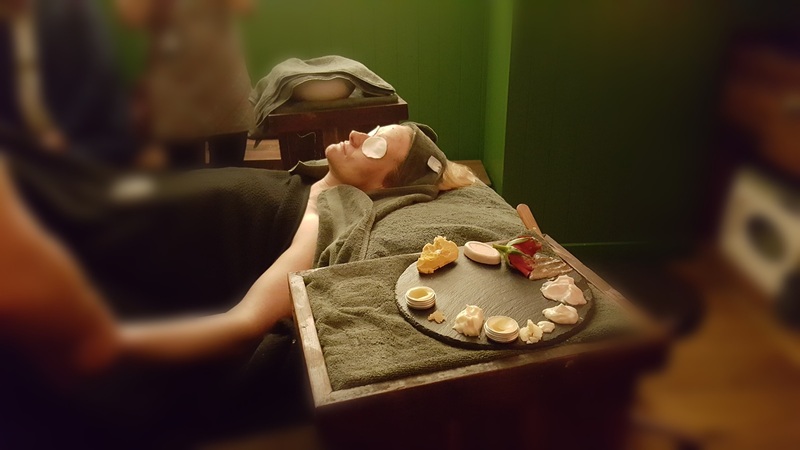 The next time you are pondering what to do, head down to Cardiff and see for yourself and maybe treat yourself to a unique spa experience like no other. Have you had a Lush Spa treatment before? What are your favourite exclusive you hope to see in store? I LOVE Lush products! This looks like such an amazing experience. Thank you for sharing!!!! It was a very fun evening. Wow! I'm jealous. I hope you blog about your experience. Once day I'll have a treatment there. If you're in or near Cardiff then it is worth a browse. Such a unique shop. This looks amazing! 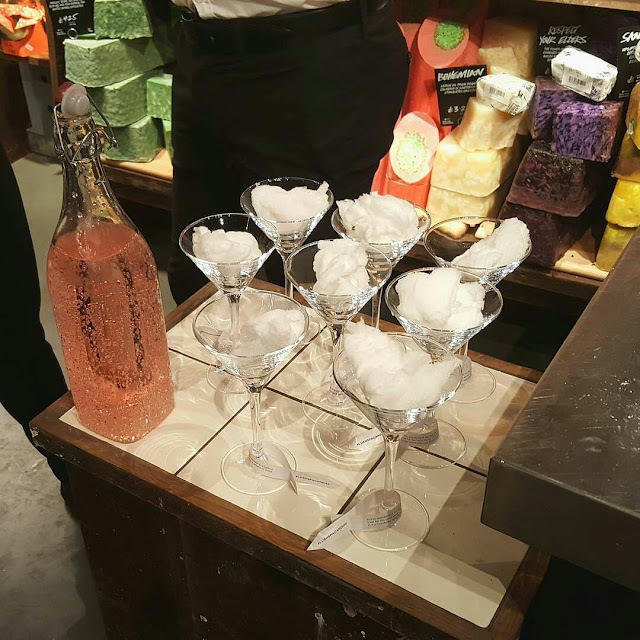 I've never tried anything from Lush but I love the look of this. Serious?!? Get yourself a bath bomb lady! I hope I get to attend more in the future. It was a lot of fun. Have visited GB, North Ireland & Scotland..Let's see if Wales is sometime next..That Lush is calling..! If you are in the UK, you must visit Wales. It has gorgeous greenery. 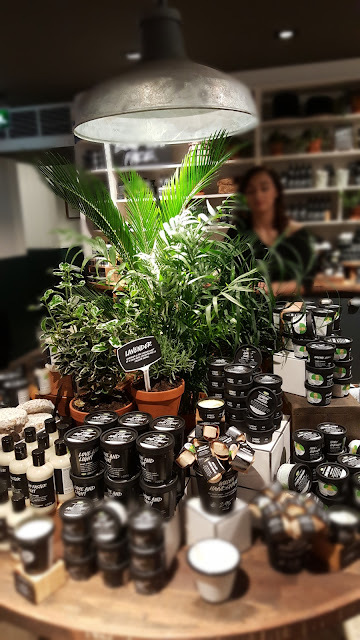 Undoubtedly, fantastic experience you had in Lush...You nicely explained in your writing and easy way to imagine the real scenerio.My last visit in Singapore, I was expecting such treatment.. but couldn't find. Now I got to know...by the way, nice pics. Thank you. I am glad you enjoyed my post. 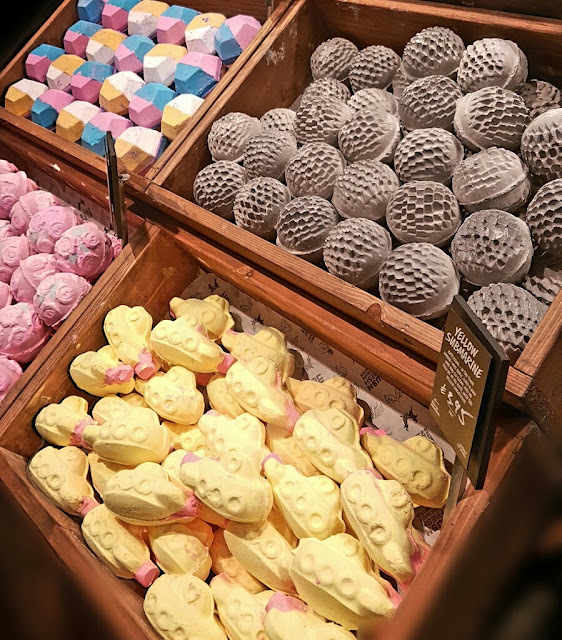 I love lush and my daughter adores their bath bombs! Also they do some great soap I used during pregnancy that really moisturises. Their bath bombs are the best and I really like their soaps too. Especially Bohemian. I am looking forward to trying it out for myself next year. I'm not dissing scrubs, mind you.... and the place looks wonderful anyway. Haha! I like chocolate in a cup or smeared over my body. Both work. Wow this looked like such a treat of an evening which reminds me how much I would love a pamper day too! It was great. I like having a pamper at home too. It was a great evening. Thank you for visiting my blog. Been a fan of Lush products for ages. Now my 11 yr old daughter has got the bug too :) love their bubble bath balls, and their heavnely body cream. Their massage bars are good too. I adore their massage bars! So moisturizing. I think Lush is a hereditary addiction. Oh it looks so busy! I'd be so stressed haha. But still, it's lush and a grand opening so I bet it was super fun for you all. Oh I love your photos aswell. Thanks Danielle! If you are ever down in Gloucestershire, come visit me and I will give you a holistic treatment :) Not quite a Lush treatment but near enough haha. I am hoping to go next year for my birthday. Fingers crossed.